Whisk flour, salt, and pepper together in a bowl. Dredge the beef cubes in the flour mixture. Place half the oil in a large skillet over medium heat. 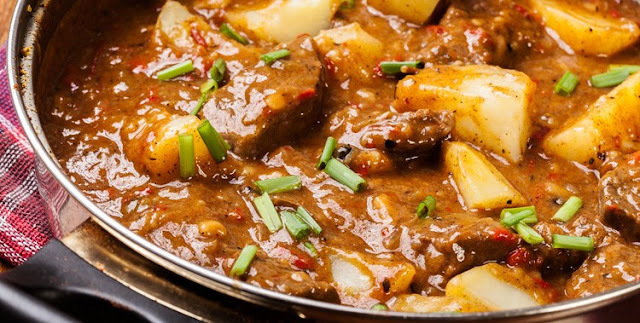 Place half of beef cubes into the skillet and cook on all sides, for about 30 seconds per side, or until golden. Do not cook the meat through, just brown the outside. Remove and set aside. Add the rest of the oil and the remaining beef cubes and repeat. Add meat pieces to the slow cooker. Add onions, potatoes, worcestershire sauce, and can of diced tomatoes with juice. Stir balsamic vinegar along with broth, garlic, oregano, and paprika, and add in. Cover and cook on high for 4 to 6 hours or low for 8 to 10 hours. Stir well.